So we're packing up the family Jetta and going to make the trip to Six Flags over Texas this weekend. Since this is our first time, I was hoping to get some advice. Want to make sure we take the right stroller. From what I can see, the park looks pretty flat, is that a fair assessment? The food options at SFoG are pretty terrible, are there any unique food options to look out for at SFoT? Since we have a two year old, most of our day will be spent headed from kiddie ride to kiddie ride, but is there a certain time of day to plan on attacking the larger attractions? Since we are Diamond Elite Members, we have two free flash passes, what two rides should we utilize those rights? Appreciate any help and advice! Texas Giant and ... Titan? Mr Freeze? I think they have an app that shows ride times. The only thing I remember from a number of years ago is they had really good fresh strawberry shortcake. I know that’s not a meal. And yeah, it’s pretty flat there. Some slopes but nothing like SDC or BGW. Have fun. It’s a nice park. Get there as early as you can Sunday morning. Everyone will be in church. You'll have extremely light crowds until about 1pm, when they'll start trickling in. This happened to us a few years ago. Thought the whole day was going to be like that, but by 3pm it was so crowded we were ready to leave. Or buy the FastLane. Line jumping is a huge problem at SFOT when the lines are long. So just do it legally. Also,if you want to ride lots of adult rides despite the 2 year old, look and see if they have a Parent Swap program. You might even be able to get away with buying only 1 Fastlane if you use a Parent swap. Not sure. PS is amazing! I hope you're not trying to go on Saturday. It's supposed to rain almost all day. If you're lucky, it might scare some people off and give you a nice time if the rain clears for the latter part of the day. I agree on using the Flash Passes for Texas Giant and Mr. Freeze. If you really want the Intamin bobsled credit, go early in the day, but don't count on it opening at all if there's any precipitation. It also has a single rider line. We've had season passes for several years and I can't remember the last time we ate anything other than popcorn or ice cream at the park. We tend to go for short visits and there are too many good options close to the park. There are some different food options: b-b-q, they just opened a street taco shop, there's a sports bar near the front gate that I believe has nachos another is being built in the Boomtown area. 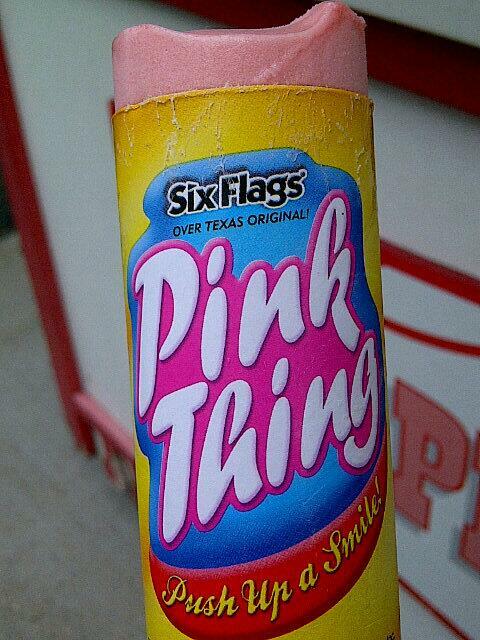 Do they still have those awful Pink Things on a plastic stick? Those are my favorite. The bobsled has terrible capacity, so definitely look into the single rider line for that. S:ToP also can get long lines. But coasterwise, NTG and Freeze are definitely the best flash pass candidates. Titan has pretty strong capacity as is. (Moved out of DFW before Joker arrived, so can't say how its lines will be). The really nice thing about SFoT is the family rides are spread out throughout the park so you can send the kids on something smaller while you ride something bigger. Definitely take a right when you enter the park. Your 4 lowest capacity rides are this way. Joker, Mr Freeze, Starflyer, then Pandemonium. While I haven't been there since Joker opened, I'd suggest using the lesser traveled path behind the train tracks and heading straight to Joker. Hit these rides first, and that will loop you back to Bugs Bunny Boomtown for the kids. Or if you want yet another Batman credit, I suppose you can knock it off your list before it gets too hot and the sewer themed tunnels in the queue become a little too realistic smelling. Other than the Bobsleds, which are on the opposite side of the park and can be skipped unless you have to get the credit, the other low capacity ride is Runaway Mountain, an indoor, dark Windstorm, and a lot of fun. Come to think of it, Shockwave, their Schwarzkopf double looper, has a pretty low capacity as well, due to its insanely slow lift hill and 2 train operation. Dang, the more i type, the more I'm realizing that more than half the coasters are low cap, slow moving lines! You know what... buy the all day FlashPass if the lines get long. Like I said, look into using the parent swap and one single Flashpass. It will probably be well worth it. Yosemite Sam's Gold River Adventure is not to be missed especially with a young one. It's a slow moving indoor boat ride, but it seems the lines are always backed up. It's nice and cool inside and it can get hot at the park. I don't think this ride has Flash Pass. SFOT is a very flat park, but expect to do a lot of walking. Especially on how packed the parking lot is. It can be long trek to from the Joker to Titan. Last thing, ride Judge Roy in the front seat. It's a beautiful classic, woodie, but the middle seats are a rough ride. Back seat is okay. They do, but they changed vendors a few years ago and changed away from the original cherry flavored recipe. I haven't tried it, but it's a fruit flavored Push Up. If I lived there I’d push back on those push ups. I hope there’s still a cute plastic stick. But something tells me no. Thank you all for your tips. So far the rain has kept crowds away and everything has been walk on. It’s cold and wet but it’s a new place and we’re having fun. Glad you're enjoying it. It was my home park for a little over a year. 1997+8. I spent a lot of time there and have always been back every few years or so, as I still find it one of the better SF parks. It was my home park for 11 years (2005-2016). For a regional park, it is fantastic in all regards. If only they could figure out a way to air condition the whole thing.